As pet parents we’ve all most likely been in situations where our dogs have gotten hurt. Whether you accidentally tripped over your dog or stepped on their paw carelessly, you’ve probably heard your dog let out a quick yelp or cry and run off. Was it pain or fear? Either way, how did you feel in that moment? Does the word horrible come to mind? We all love our dogs and we would NEVER want to inflict pain on them or hurt them in any way, shape, or form. As humans, most of us associate pain with some kind of vocal response, be it a cry, yelp, whine, or whimper. Heaven knows when we are in pain we do all of the above and more, complaining to everyone around us. But when it comes to our dogs, how they communicate when they are in pain is completely different than what most people think. Just this week in my practice a five-month old boxer puppy named Caleigh came in partially weight-bearing on her left front leg. Her dad told me that she started limping over the weekend, and he had no idea why. She never cried or complained. He never saw any kind of accident or trauma. She even took a four-hour car ride with him to visit his children in Boston without a complaint. When I examined Caleigh my only finding was that she had heat coming from the left front carpus (wrist), and when I pressed on the joint she tried to move away from me. She never cried once during my exam. My obvious next step was to take an x-ray of her leg. To my surprise I found that she had a complete fracture of both the radius and ulna. Thankfully, Caleigh will be fine. 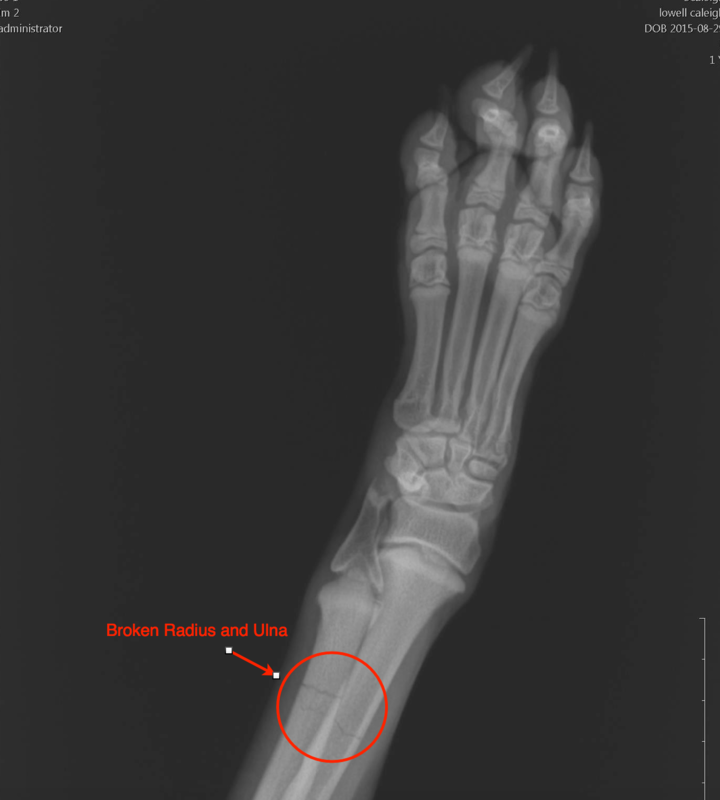 The bone was not displaced, so I splinted the leg, immobilizing the joints above and below, and sent her home with pain medications and an appointment in two weeks for a cast change. In acute, extreme situations such as Caleigh’s in which she actually had a broken bone, our rational minds come to accept that yes Caleigh must be in pain. If you have ever broken any bones, you know this hurts BIG TIME! Yet Caleigh never cried once. 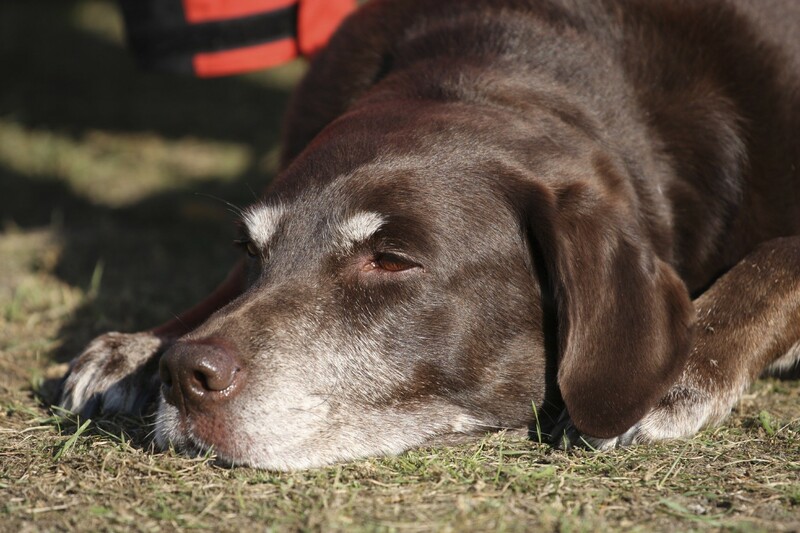 So what about situations in which the pain is more chronic, such as a dog who is dealing with chronic arthritis? Are these dogs actually experiencing pain? And if so why don’t most pet owners “pick up” on it? For over ten years in my rehabilitation practice I’ve asked the same question to my clients whose dogs were diagnosed with arthritis. Do you think your dog is in pain? And 90% of the time, they say no. When I ask them how they know, the answer is always the same: They tell me their dog never cries or whimpers. It took me a few years and a lot of hyper-focusing on this issue to finally come to the realization that the problem is NOT how our dogs communicate. The real issue is that we are not actually “listening” to them correctly. We are listening with human ears and observing with human eyes, not with the ears and eyes of a dog. Then I discovered one very big word that explained it all: anthropomorphism. What this means is that we try to interpret our pet’s emotions or behaviors as if they were human. In other words, because we love and bond with our dogs on such an intense level we in a sense “think they are humans” and therefore expect our pets to show or communicate signs of pain the same way humans do. We expect them to cry, whine, whimper, or complain. Yet the reality is that they are dogs and not humans. We should “think, look and listen” more like dogs if we truly want to connect with them. And when it comes to pain evaluation, we need to learn how to listen to them. After years of evaluating and listening to both my patients and their parents, I created a list of the most common signs or signals that our dogs use to tell us they are in pain, which I highlight in my new book Dogs Don’t Cry. Because the majority of this communication is not vocalized, I named them “The Silent Signs of Dog Pain,” and they relate specifically to bone and joint pain. Obviously some of these “Silent Signs” on an individual basis can signal problems other than just bone or joint pain alone. If after reading this list you think your dog may be displaying one or more of these signs, I strongly encourage you to make an appointment with your veterinarian to discuss the issue. My takeaway advice is this: As loving pet parents, NOW is the time for us to change the way we answer the question of whether or not we think our dog is in pain. In order to do this, WE need to LEARN how to LISTEN to our dogs more carefully with open minds and open hearts. You can find my book Dogs Don’t Cry on Amazon. Click here to learn more. 100% of book sales are being donated directly to help senior dogs in rescues who need pain management. Dr. James St.Clair, is author of Dogs Don’t Cry, an Amazon #1 Best Seller. He is also the author of the 5-Star Rated, TopDog Health Home Rehabilitation Guides which provide step-by-step instructions on how best to help your dog recover after some of the most common orthopedic surgeries. Dr. St.Clair currently owns a progressive four-doctor small animal practice in central Connecticut. In 2004 he founded TopDog Health & Rehabilitation which is now one of the internet's most trusted sources for pet owner information and products when it comes to orthopedic surgery and joint health management. Dr. St.Clair is passionate about education and making dogs comfortable and pain free.